Tagged with Canada, Saudi Arabia. As the deadline for government-funded Saudi students to leave Canada approaches, institutions and associations are prioritising student support amid the uncertainty. 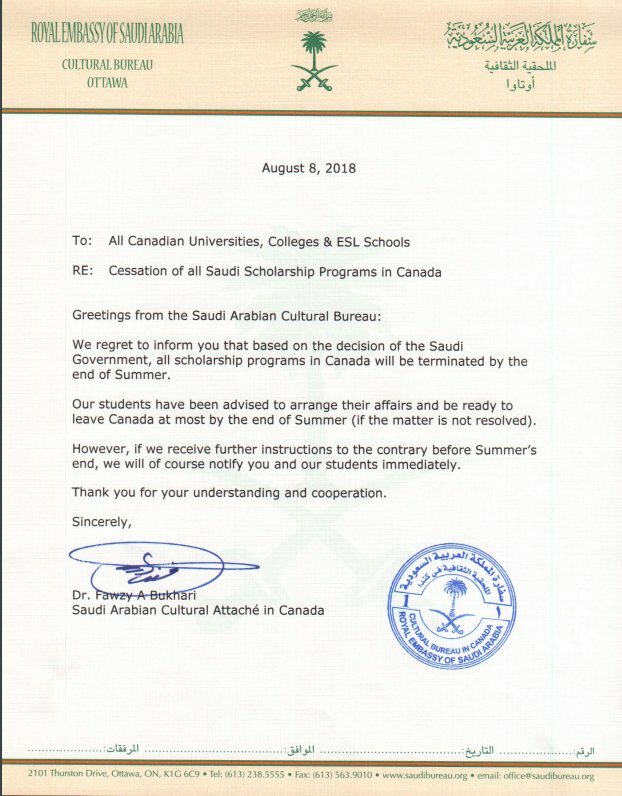 All stakeholders The PIE News reached out to reported that the order for students on Saudi government scholarships to leave Canada by the end of summer still stands. Many have also spoken of “unimaginable” stress caused to students. The letter received by institutions, shared with The PIE News by a source with knowledge of the events. “Some students will be able to stay to finish up their degrees, if they are close to finishing,” she explained. “I can’t even imagine the kind of anxiety the students must be feeling”. Knutson added she is aware that the Canadian federal government is looking at ways to support students who decide to stay. The Saudi Arabian Cultural Bureau in Canada hosted an information meeting for students on Saturday 21 August, a video of which was posted on Twitter. In the meeting, students were told that the Saudi government would stop paying fees to Canadian universities and that they would be supported transferring to other institutions. It was made clear that only sponsored students needed to leave Canada, but there was still uncertainty for students nearing the end of their courses, with PhD students told they may have to “start over” if they were to transfer to another institution. Although the order to leave Canada affects mostly government-funded students, stakeholders have reported that unofficially also self-funded students are being “encouraged” to leave. Joe Wong, vice-provost & associate vice-president at the University of Toronto told The PIE that presumably all 77 students from Saudi Arabia at the institution, 48 of whom are on scholarship, have received the letter from the Saudi government. But official guidance is still lacking, Wong added, with no official contact from either governments. The University of Toronto hasn’t made any formal contact with other institutions abroad, Wong stated, but its priority is to ensure students receive their transcripts quickly and are supported with transfer credit, to mitigate any negative implications on their academic records. “I can’t even imagine the kind of anxiety the students must be feeling…the main concern is the potential disruption to their studies,” he said. Gonzalo Peralta, executive director of Languages Canada, told The PIE that the member schools are striving to provide emotional support to the students affected and find alternative plans. Institutions with operations in other countries are facilitating students’ transition, with the US and the UK the most likely alternative destinations, Peralta explained. Peralta added that a concern for the sector is the impact on the relationships between the two countries, which industry stakeholders on both sides had been investing in and developing. The industry in his view has been caught in diplomatic crossfire, victim of its own success. “This is not between the schools, the agents and the students. It’s quite clear that there’s a real willingness to work together and collaborate. It’s between the two governments and international education was caught in the crossfire,” he explained. He added that while the association is in dialogue with the government, it is also considering ways to support Saudi students that are looking to study in Canada in the future. Colleges and Institutes Canada is also building bridges for the future. “Members with Saudi students are looking at innovative ideas to make it possible and easy for students to return to their studies once the situation gets back to normality,” VP international Alain Roy told The PIE News. In the long term, CICan will also be working to continue diversifying its source markets. “We will continue to have rich and diverse campuses and also we will limit our vulnerability to situations like this one,” he said. Universities Canada said the sector remains hopeful that a resolution can eventually be achieved. “We are in contact with the Saudi Cultural Bureau in Canada and the Canadian government to share our concerns on the human impact this decision is having on students,” a spokesperson told The PIE. Universities in other destination countries are getting ready to welcome the Saudi students who will relocate from Canada. The University of Portland in the US has made headlines in August after it announced an “easier” admission process for Saudi students. But applications are arriving also on the other side of the Atlantic. “Like other institutions, we have received a number of applications from Saudi students who had previously studied in Canada,” Chris Chang, pro-vice chancellor, global engagement, at the University of Portsmouth told The PIE News. He explained that the university is working to ensure that their application processing meets the deadline for the start of the next academic year. “The challenge is the mapping of the qualifications to our courses, so that they are given the right level of advanced standing in line with the QAA guidelines on accreditation of prior learning,” Chang said. Additional reporting by Viggo Stacey and Zein Al Maha Oweis.